Mysuru: Heavy rains continue to pound the city since the last several days and this, accompanied by gusty winds, is causing havoc, as several trees are being uprooted. In one such incident, a tree which was uprooted fell on an electric pole last evening near Ballal Circle in front of Urs Kar Showroom on New Kantharaj Urs Road. The rains began around 5 pm and poured for more than an hour accompanied by strong winds. 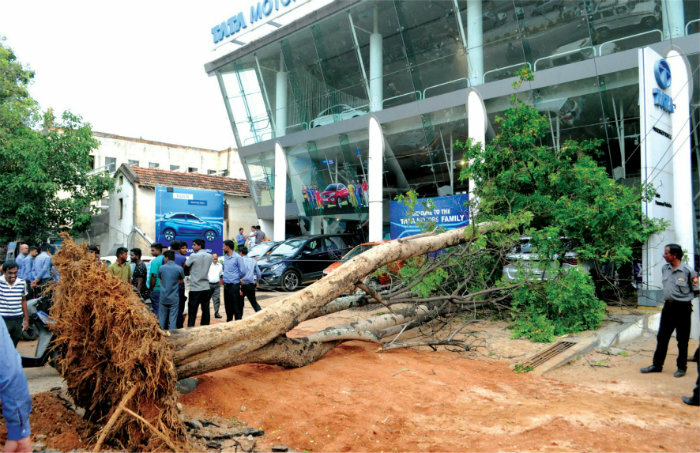 A tree in front of the car showroom fell on the electric pole which broke into two. A portion of the branch fell on the showroom owner M.A. Kantharaj Urs’ car and a portion of it was damaged. A tree uprooted near Ballal Circle in front of Urs Kar Showroom on New Kantharaj Urs Road yesterday. The moment the electric pole fell on the ground, the power went off and thus no one was injured. The MCC Abhaya team, on receiving information, immediately reached the spot and cleared the tree. Traffic was disrupted for some time on this road. Disruption in power: Power supply was disrupted last night in several areas including Marigudi, Ittigegud, Nazarbad, in and around Suburban Bus Stand, Olympia Theatre and K.T. Street for some time. There are several trees which are dying and are weak, which is a cause for concern as it can fall down any time resulting in loss of lives and property. One such incident which is fresh in memory is when a tree fell on an autorickshaw near ESI Hospital on KRS Road that killed a woman employee of Infosys, Revathi from Tamil Nadu, on Tuesday. However, her friend Vasavi and autorickshaw driver Rajanna escaped with minor injuries. There is another tree just a little distance away from where the incident occurred which is weak and dying. This tree stands between ESI Hospital and Gokul Theatre Road divider and can fall anytime, especially this being windy season. There is a lot of traffic on this road with heavy vehicles, cars, two-wheelers plying regularly. The possibility of it falling on the vehicles just like the earlier incident is quite high. Likewise, the branches of a huge tree at the junction of Tyagaraja Road and Chamaraja Double Road have completely dried up. The density of traffic is heavy here and if the branches break and fall down it could result in serious injuries and also loss of life. This is the general scene in most of the places where dead old trees are posing dangers to life and limb. In spite of bringing such problems to the notice of Mysuru City Corporation (MCC), nothing much is being done as the officials keep giving excuse of the restrictions imposed by the Forest Department. The monsoon season is going to begin in another 15 days and before that the dead trees and weak branches have to be removed. The District Administration has to view this seriously and take steps, feel the public. 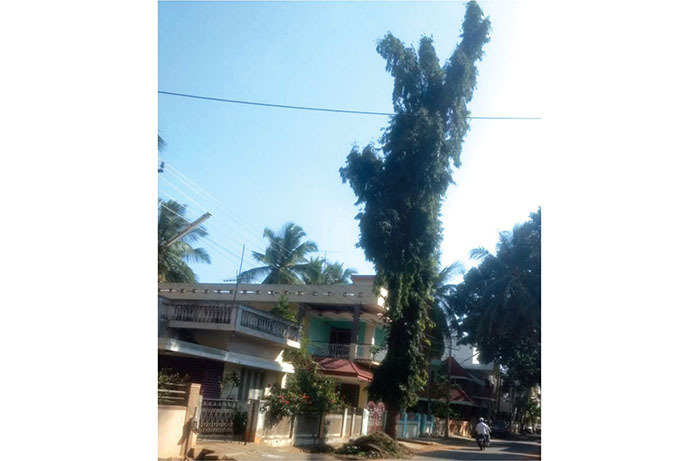 : This tree on Navilu Main Road in Kuvempunagar, which has grown to a height of 40-50 feet, is posing danger to residents as a live electric line also passes under this tree. Repeated oral request to authorities concerned to prune the tree has not yielded any results. The branches of the trees hanging on KRS Main Road near Vani Vilas Water Works are almost leaning on the road and most of it looks dry. Since the branches are leaning towards the road, the bus drivers on this road are anxious that it would hit the top of the buses causing damage. Hence, instead of keeping to their lanes, they are forced to drive on the middle of the road. This is causing problems to the vehicles coming from the opposite direction. 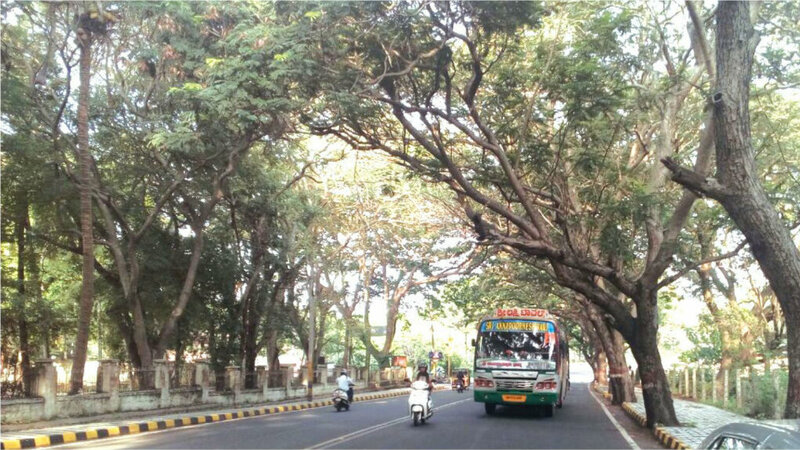 The public have appealed that the branches leaning towards the road must be cleared at the earliest so that there is safe movement of the traffic.